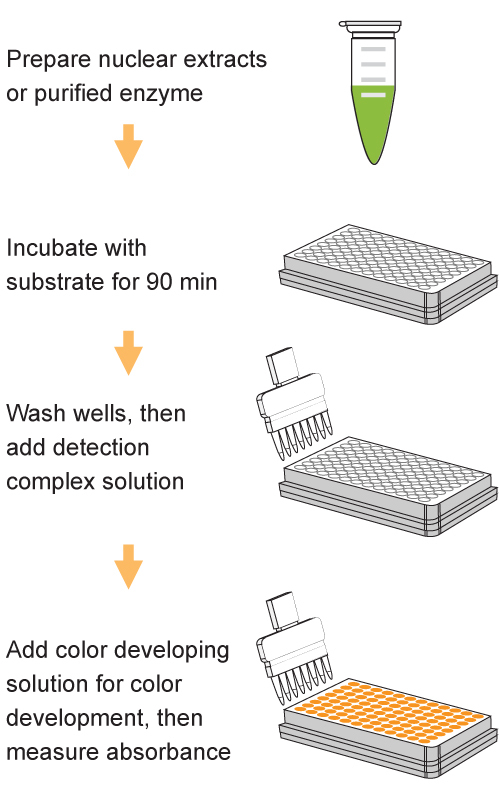 Schematic procedure of the EpiQuik DNMT Activity/Inhibition ELISA Easy Kit (Colorimetric). Demonstration of high sensitivity and specificity of DNMTDNMT activity/inhibition achieved by using nuclear extracts with the EpiQuik DNMT Activity/Inhibition ELISA Easy Kit (Colorimetric). Nuclear extracts were prepared from Hela cell line. 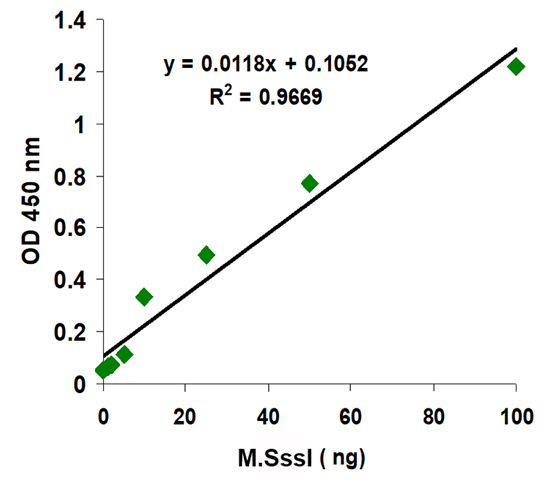 Demonstration of high sensitivity and specificity of DNMT activity/inhibition achieved by using DNA methylase M.SssI with the EpiQuik DNMT Activity/Inhibition ELISA Easy Kit (Colorimetric). The EpiQuik DNMT Activity/Inhibition ELISA Easy Kit (Colorimetric) is a complete set of optimized buffers and reagents that allows the experimenter to measure DNA methyltransferase activity or inhibition using nuclear extracts or purified enzymes from a broad range of species in an easy and fast manner. The species include mammals, plants, fungi, bacteria, and viruses in a variety of forms including, but not limited to, cultured cells and fresh and frozen tissues. The kit is ready-to-use and provides all the essential components needed to carry out a successful DNMT activity/inhibition experiment without the need for radioactivity or any special equipment. Nuclear extracts can be prepared by using your own successful method. For your convenience and the best results, EpiGentek also offers a nuclear extraction kit optimized for use with this kit. Nuclear extracts can be used immediately or stored at –80°C for future use. Purified enzymes can be active DNMTs from recombinant proteins or isolated from cell/tissues. The EpiQuik DNMT Activity/Inhibition ELISA Easy Kit (Colorimetric) is a further refinement of its predecessor kit by simplifying the steps, significantly decreasing assay time, and increasing assay sensitivity. Fast - Reduced steps so that the entire procedure only needs 2 hours and 10 minutes. Sensitive - Detection limit can be as low as 0.2 ng of purified enzymes, which is ten times better than the predecessor kit. Convenient - Ready to use with all essential components. No need for radioactivity or any special equipment. Robust - Improved kit composition allows the assay to have a greater “signal window” with reduced variation between replicates. Flexible - 96 strip-well microplate format makes the assay available for manual or high throughput analysis. The EpiQuik Nuclear Extraction Kit has also been optimized for use with this kit. DNA methylation occurs by a covalent addition of a methyl group at the 5-carbon of the cytosine ring, resulting in 5-methylcytosine. These methyl groups project into the major grooves of DNA and inhibit transcription. In human DNA, 5-methylcytosine is found in approximately 1.5% of genomic DNA, primarily at CpG sites. There are clusters of CpG sites at 0.3 to 2 kb stretches of DNA known as CpG islands that are typically found in or near promoter regions of genes, where transcription is initiated. In the bulk of genomic DNA, most CpG sites are heavily methylated. However, CpG islands in germ-line tissue and promoters of normal somatic cells remain unmethylated, allowing gene expression to occur. When a CpG island in the promoter region of a gene is methylated, the expression of the gene is repressed. The repression can be caused by directly inhibiting the binding of specific transcription factors, and indirectly by recruiting methyl-CpG-binding proteins and their associated repressive chromatin remodeling activity. In addition to the effect on gene transcription, DNA methylation is also involved in genomic imprinting, which refers to a parental origin-specific expression of a gene, and the formation of a chromatin domain.DNA methylation is controlled at several different levels in normal and diseased cells. The addition of methyl groups is carried out by a family of enzymes, DNA methyltransferases (DNMTs). Chromatin structure in the vicinity of gene promoters also affects DNA methylation and transcriptional activity. Three DNMTs (DNMT1, DNMT3A, and DNMT3B) are required for the establishment and maintenance of DNA methylation patterns. Two additional enzymes (DNMT2 and DNMT3L) may also have more specialized but related functions. DNMT1 appears to be responsible for the maintenance of established patterns of DNA methylation, while DNMT3A and DNMT3B seem to mediate the establishment of new or de novo DNA methylation patterns. DNMT3L is found to be a catalytically inactive regulatory factor of DNA methyltransferases, which is essential for the function of DNMT3A and DNMT3B. Diseased cells such as cancer cells may be different in that DNMT1 alone is not responsible for maintaining abnormal gene hypermethylation and both DNMT1 and DNMT3B may be cooperative for this function. The local chromatin structure also contributes to the control of DNA methylation. This kit contains all reagents necessary for the measurement of DNMT activity or inhibition. In this assay, a universal DNMT substrate is stably coated onto microplate wells. DNMT enzymes transfer a methyl group to cytosine from AdoMet to methylate DNA substrate and the methylated DNA can be recognized with an anti-5-methylcytosine antibody. The ratio or amount of methylated DNA, which is proportional to enzyme activity, can then be measured through an ELISA-like reaction by reading the absorbance in a microplate spectrophotometer at a wavelength of 450 nm. The activity of DNMT enzymes is proportional to the optical density intensity measured. 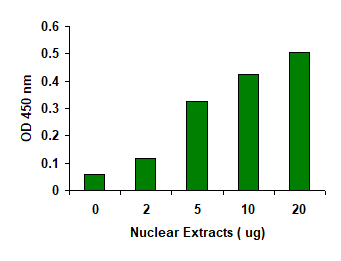 The amount of nuclear extracts for each assay can be between 0.5 µg and 20 µg with an optimal range of 5 µg to 10 µg. The amount of purified enzymes can be 0.2 ng to 100 ng, depending on the purity and catalytic activity of the enzymes.